Country’s last Himalayan Villages of India painstakingly save endangered national herbal treasures with Promising multi-fold in farm income. They remain yet in anticipation of vital government Support. 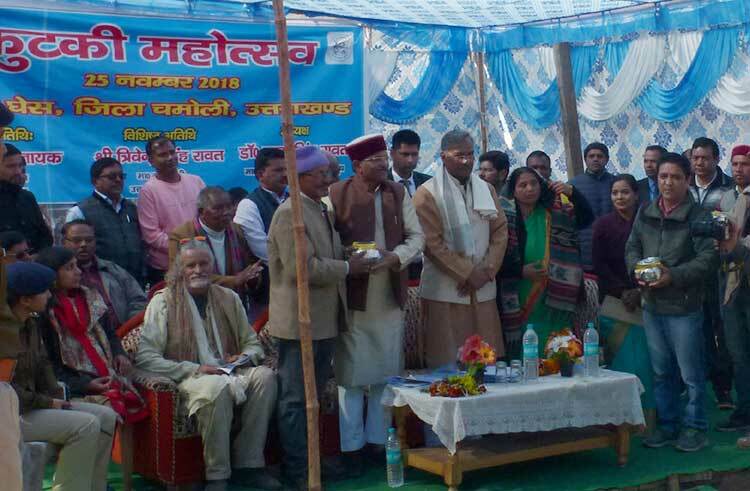 With high aspirations these villages celebrated Kutki (an Endangered Herb) Mahotsav with Chief Minister, Uttarakhand State & Ayush Minister, Govt. Of India. They aspire strengthened implementing mechanism to succeeding in preserving and serving world community with farmed native divine Himalayan flora. While many parts of the country and the world are busy with Blockchain and AI, remote Himalayan villages of Uttarakhand are yet to witness many basic amenities. Speaking of which, one must never forget the overt and covert costs different models of development have over the flora and fauna. Recently members of state as well as centre government visited some of these places to take part in an event “Kutki Mahatosav”. 25th November, 2018 earmarked a new ray of light for herbal farmers of country’s furthest Himalayan highland villages, Kailganga Valley of District Chamoli, Uttarakhand State, India. It brought hope to farmer hard work and struggle with positivity for convergence with Government and civil society mobility. Kutki (endangered herb) Mahotsav (Festive) was celebrated by the community with Honorable Chief Minister Shri.Trivendra Singh Rawatji, Honorable Ayush Minister, GOI, Shri.Sripad Naikji, revered guest and Dignitaries. The Mahotsav aspired addressing farmer woes, recognize, felicitate, celebrate & strengthen farmer cultivation Initiatives for promulgation of endangered herbs of Indian Himalayas and seeking sustained livelihood via economic returns with most aspired Govt. cooperation. The region Kailganga valley comprise of highland Himalayan villages Ghesh, Himani, Balan & Pinou, in the pristine furthest habitation and mystical realms of majestic Peak Trishuli (Nandadevi group of High Himalayan Peaks) bordering India with Tibet. Situated 27kms away from road until recently (year 2013), the Valley was amongst the furthest remote habitation regions of Uttarakhand Himalayas. Herb Kutki (Picrorhiza Kurrooa) is alpine snowbound Himalayan endangered herb. Hence a national herbal treasure. It is immensely revered as panacea for Liver, Indigestion & Numerous ailments – Ayurveda/Charak Samhita. Uttaranchal Youth and Rural Development Centre (UYRDC), a grass root organization and Farmers of Village Ghesh embarked on the mission to save endangered Himalayan herbs by engaging under cultivation since year 2001 (18 years since). Thus modelling high value produce farming in already marginal landholdings for demonstrating successful, sustainable and replicable farming endeavour. The farmers grew the herb Kutki with other endangered herbs (Kuth – Saussurea costus, Atis – Aconitum heterophyllum). The journey has been much enduring and testament to the never give up spirits of mountain herbal farmers in the most remote regions since the program inception. With able guidance and foresightedness of Dr.Aditya Narain Purohitji, the vision of honourable and late revered Dr.Abdul Kalamji, capacity support of TIFAC, GOI, New Delhi, HAPPRC & HRDI, Govt. Uttarakhand, the journey accomplished numerous milestones from research through farming to international trade. UYRDC, empowered and established a self-reliant herbal farmer Cooperative “Kamgar Swayat Sahkarita”, year 2006. The farmer cooperative also being an exporter is the first ever in the state to trade the herb in international market from remotest regions, since 2009. The endeavour has traversed a long meticulous path, from farmed earnings of Rs.1,50,000/acre in 2004 to Rs.5,00,000/acre in national and Rs.7,00,000/acre in international market today for Kutki herb. The crop cycle is Biennial. Farmer’s herbal endeavour has increased from 10 farmers in program inception to more than 300 farmers within and neighbouring valleys. Thus promising revival of endangered herbs with doubling of farmer income, addressing conservation, ecology sustainability of numerous valuable native bio-diversity. UYRDC collaborated with Dunagiri Foundation, New Delhi to leverage farmer global outreach via creation of easy farmer friendly technological processes for global trade and farm replicablity. Having presented innumerable possibilities, the journey had endured through persisting challenges detrimental to farmer endeavour. Hence, it was pertinent to highlight inadequacy of requisite resource support, procedural sanctions and bottle necks, farmer driven herbal policy, unorganized market impulse, organic farming certification and reverence for herbal growers. The need for single window processing and clearance for farmer registration and trade transits (Within the country and overseas trade). Thus aspiring convergence of state and central governments with pro-farmer policies. This shall overcome farmers from inhibitions and encourage them to aspire and seek herbal farming in their remote Himalayan hinterlands. Request for speeding Organic certificate provision for Kutki produce of farmers as the market wishes to have produce as organic certified. (Farmers have been growing the herbs since 2001. The entire agriculture land in the development block has been matured under Organic certification, however, certification for Kutki remains awaited for Ghesh Farmers). Request for provisioning the enabling resources, centre of excellence from Nursery to Cultivation to Post Harvesting system for improving produce quality and addressing farmer – market aspiration. Aspired that Kutki Mahotsav be celebrated every year for herbal, farmer and biodiversity wellbeing, for brining into grower’s village the govt. institutions, traders and scientist. With the objective to overcome procedural, technological bottlenecks, and enable farmers get appreciable quoted price. The Ayush Minister Shri.Sripad Naikji announced that Ayush Ministry shall facilitate in making Village Ghesh Ayush Gram & shall recommend for setting up National Institute for Ayush in the region. The Chief Minster Shri.Trivendra Singh Rawatji appreciated and accolade farmer’s herbal endeavour and welcomed Kutki Mahotsav. He said that the issues highlighted shall be looked into and pursued. He delegated the District magistrate, Chamoli to prepare a Detailed Project Report for augmenting Farmer endeavour in Herbal farming and allied agriculture endeavours for holistic development of the region. The event was also special as it brought forward the opportunity to put together many other social accomplishments of Village Ghesh and Kailganga valley. Thus enabling celebration to more stakeholders within the Herbal Mahotsav Day. Such as rose farming endeavour initiatives from CAP (Centre for Aromatic Plant, state govt. ), felicitating herbal growers and commemorating the first electricity light to Ghesh Village after 70 years of independence. Farmer’s Cooperative Kamgar Swayat Sahkarita hence expresses urgent action for saving endangered herb promulgation and farmer prosperity, as announced by honourable Chief Minister & Ayush Minister in the valley. It is pertinent that immensely vital flora be promulgated for nurturing the health of Mankind and Mother Earth. Guest and Diginitaries present in the Mahotsav where the District Magistrate Mrs.Swati Baduria, Shri.Vivek Dewanji & Shri.Prashanti De Jagar, Dunagiri Foundation, C.D.O, Chamoli, S.P, District Chamoli, Regional Director North – NMPB, New Delhi, Dr.B.P.Nautiyal, Dean, Dr.V.K.Purohit HAPPRC, Dr.C.P.Kuniyal HRDI, Smt.Munni Deviji, MLA, Community of Village Ghesh, Himani, Balan & Pinou. It is important that the respective state and centre governments take action towards meeting the aspirations of the community. Himalaya is pride of the nation, so are the Himalayans! Narainbagar, District Chamoli, Uttarakhand – 246455. Ashish Kumar Singh, Doctoral Candidate, Political Science, NRU-HSE, Moscow. Siddhartha Negi, Director, UYRDC, Chamoli, Uttarakhand, India.